After a few hours of strolling around Shibuya, you're sure to want to take a break and maybe have a coffee or sweet treat, but where should you go? Here are five great and very convenient cafes where you can relax and enjoy yourself. After a day of sightseeing and shopping, you may find yourself both thirsty and tired in Shibuya. But where to go for a drink and a break? If you've been walking all day, you probably want to go someplace nearby that is convenient, so in this article, we have outlined five different cafes located in various parts of Shibuya. While there are many different cafes and restaurants found all over Shibuya, the five locations listed here all have menus in other languages (with photos too), and take all major credit cards too. Not only that, but all of these cafes also have free wi-fi, so you can even use your phone or smart devices in them as well. There is a handy map at the end of this article too, so you can easily find your way to your nearest cafe. Perhaps one of the most famous of its locations in the world, the Starbucks Coffee Shibuya Tsutaya stands directly across from Shibuya Station, and makes up one side of the famous Shibuya Scramble Crossing. From this cafe, you can easily look out and view the crossing, as well as the rest of the Shibuya Station area. Unfortunately, because it is in such a prime location, you may be hard pressed to get a seat here, especially a window one. It can be very crowded when it comes to simply ordering your drink though, so you may want to consider this a last resort, or head here early in the day. If you are looking to enjoy an air of sophistication and delicious French and French-inspired cuisines made with the best seasonal ingredients, then a stop at the L'Occitane Cafe is the thing for you. This cafe is located right above their shop, which is directly across from Shibuya Station, near the famous Scramble Crossing. 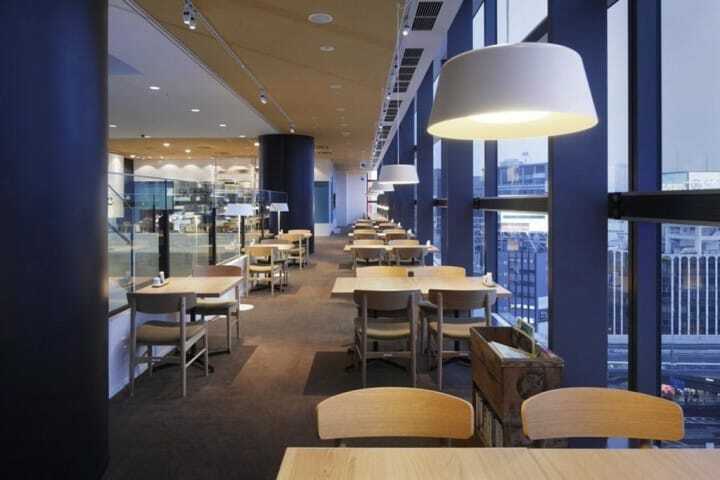 This cafe is spread out over the second and third floors, with large windows that give you a great viewing spot for the intersection and the area around Shibuya Station as well. The decor is also very Provence-inspired, and you may find yourself wondering just what country you're in if you stay there long enough! From: Shopping In Shibuya? Check Out These 9 Shops Near The Station! Known to the locals and trend-setters around Japan alike as Maru-kyu, Shibuya 109 is the place for young women and teens to shop for all the absolute latest and hottest fashions. Shops here tend to change their displays almost daily, and if you wait to come back later to pick up an item, you might find it sold out. That's how popular the shops here are. But on the seventh floor, there are two very peaceful cafes you are sure to get a seat at. You can choose from cafe Ma Maison, which serves both light cafe meals, including pancakes and French toast, and dinner sets as well. Or, you can take a seat at the Italian restaurant and cafe Kiriko de Napoli, where you can choose from nineteen different types of pasta dishes, or satisfy your sweet tooth with one of their great parfaits instead. Music lovers are sure to have heard of Tower Records before, but have you ever heard of the Tower Records Cafe? Found on the second floor of their landmark location in Shibuya, the Tower Records Cafe is the place to go if you want to enjoy a light meal or some great beverages in a relaxing setting. The cafe has a really trendy, modern atmosphere, and there is also Tower Books, a book store selling travel, current events, fiction, and other popular genres of books in both English and Japanese. Why not pick up a book or magazine to enjoy along with your coffee or meal in the cafe? Plus, if you're of age and looking for a place to take a break in the summer, they also host a great beer garden too! ** Books etc must be purchased separately before entering the cafe. Shibuya Hikarie is a new, high-rise commercial complex in Shibuya, directly connected to Shibuya Station. Although best known as a shopping and culture center, you will also find a wide variety of cafes and restaurants in Hikarie. If you're just looking for a quick drink, or someplace to stop by for a light meal, then in ShinQs, rather than on the restaurant floors, you will find The Cream Of The Crop (1F), Harbs (4F), which also sells their own freshly made cakes, and Zen Kashoin (5F), a Japanese style tea house and cafe originally from Kyoto. Not only that, but there is also a pop-up style guest cafe, on B1F, where there are limited edition cafes featuring different popular characters or anime series too. These cafes tend to only run for about two months though, so if you want to see the cafe and try their character-based treats, you'll have to hurry! On the 8th floor of Hikarie you can take a rest and enjoy lunch at d47 Shokudo, a restaurant where you can taste regional specialties from all around Japan. With most of the seats being near the window, you can enjoy a great view over Shibuya! Taking a break at a cafe is one of the finer points of sightseeing in Tokyo. You can enjoy a great drink or light snack, plan out the rest of your day, or even just chill out with a good book or on your phone. Don't let travel fatigue wear you out during your time in Japan. Make sure to take a break when you need one, and have some fun while you're at it at one of these cafes in Shibuya!